Georgia Aquarium and the Marine Megafauna Foundation have been working together for the last few years to study whale sharks and manta rays across the globe. From studying the migration patterns, to taking blood draws, both organizations are determined to learn more about both species, which are the world’s largest fish and largest ray, respectively. In September 2015, Georgia Aquarium joined the Marine Megafauna Foundation chief whale shark scientists Dr. Simon Pierce, and other partners on an expedition to Darwin Island, located in the far northern region of the Galapagos Marine Reserve in Ecuador. 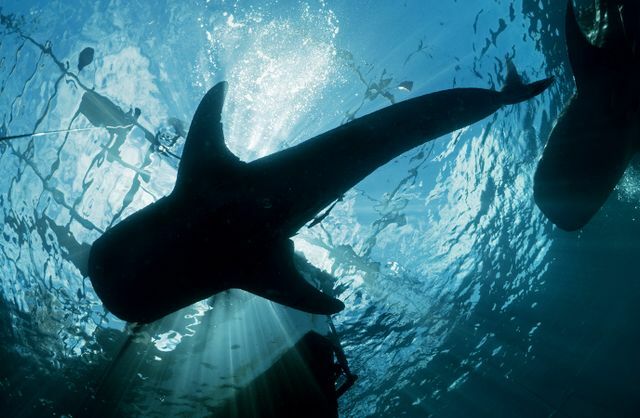 The objective of this trip was to document the movements and behaviors of whale sharks to understand its natural history and to improve international conservation measures of this now endangered species. To learn more about this research expedition, check out our blog. The research initiatives continued in 2016 when a team of Georgia Aquarium researchers, led by Dr. Alistair Dove, vice president of research and conservation at Georgia Aquarium, set out on a journey to the remote St. Helena Island. Georgia Aquarium’s partnership with the Marine Megafauna Foundation, along with the St. Helena Government and the Mote Marine Laboratory, allowed researchers to travel the long distance to help study whale sharks. The team used a variety of research techniques, including computer-aided photographic identification, laser calipers to measure size, and several different types of tracking tags to help determine where whale sharks come from and where they go. Read Georgia Aquarium’s blog to learn more about this expedition. A team of Georgia Aquarium researchers returned to the waters off the coast of Marineland, Fla., earlier this spring to study manta rays, along with partners from the Marine Megafauna Foundation. A team of researchers, led by Dr. Andrea Marshall, founder and executive director of the Marine Megafauna Foundation, believe a third species of manta rays lives off the coast of Florida. Genetics testing using the collected tissue samples will help prove or disprove the theory. “One of the most satisfying parts of this project is developing our partnership with the committed conservation scientists from Marine Megafauna Foundation,” said Dr. Dove. Little is known about manta rays and their migratory patterns, which makes manta ray research very important. To learn more about our manta ray research, read our blog. In Fall 2016, researchers once again returned to the Galapagos in hopes of tagging and researching whale sharks. Researchers studied them with colleagues from Universidad San Francisco de Quito (USFQ), Marine Megafauna Foundation, and the Galapagos National Park. Large, apparently pregnant, female whale sharks were supposed to swim past the location of our researchers during the time of their expedition. The goal was to prove that they were pregnant by taking a blood sample using techniques developed and refined with whale sharks at Georgia Aquarium. Learn more about this expedition on our blog. Georgia Aquarium and the Marine Megafauna Foundation have collaborated on many research expeditions in an attempt to learn more about this endangered species. 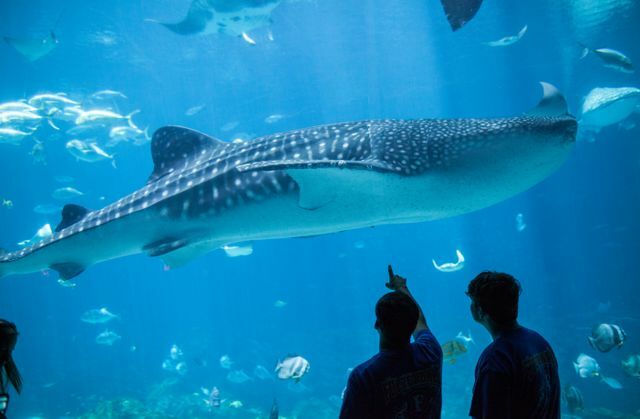 On August 30, Georgia Aquarium is celebrating International Whale Shark Day and hosting a 9-year-old whale shark advocate named Owen, who will be holding a lemonade stand to raise money and awareness for these animals. All of the proceeds from Owen’s Lemonade Stand will be donated to the Marine Megafauna Foundation to further their conservation efforts. 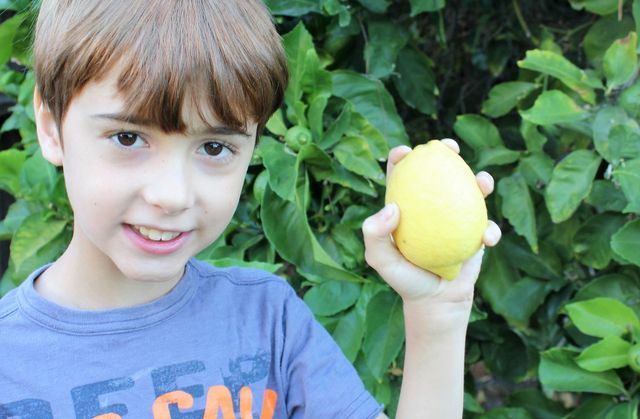 To donate to Owen’s cause and help whale sharks, please visit Owen's Virtual Lemonade Stand.